Some call it "the vine that ate the South." It grows up to 1 ft. (30 cm) every day in the summer months, and can break power lines, kill trees and collapse buildings. Used for decorative and medicinal purposes in Asia, kudzu was first seen in the U.S. when the Japanese made it part of a garden at the Centennial Exposition in Philadelphia in 1876. Americans fell in love with the vine's bright green leaves and fragrant flowers; in the 1930s, the government paid farmers to plant it to prevent soil erosion. 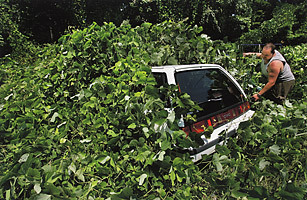 But kudzu grew too well outside its natural habitat; it thrives in the hot summers and mild winters of the southern states, is difficult to uproot and has no natural predators outside of Asia. It now covers seven million acres of the Southeast.